This week’s post is a guest star recipe that was very kindly contributed to us by Mille Patisserie, to teach us how to make something we’ve never tried before… The doors to the beautiful Mille Patisserie recently opened in Paddington, where they serve eight flavour variations of the classic French cake Gâteau Mille crêpes. They make these using specially sourced ingredients, including our Shipton Mill soft white flour, Valrhona 70% dark chocolate tempered in-house, Sicilian lemons juiced by hand, and sesame seeds imported from Nagoya in Japan, baked and ground in-house. Delicate crêpes are layered on top of each other interspersed with cream, to build the layers of these stunning creations. 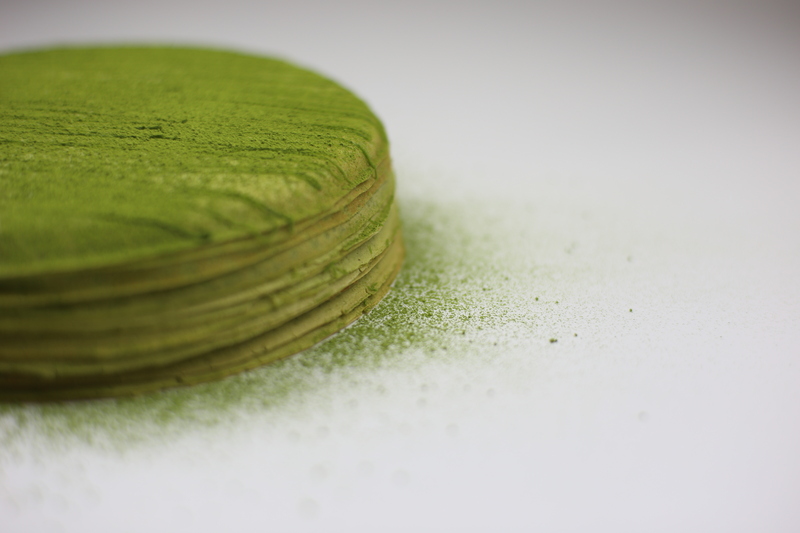 Mille very kindly agreed to share their recipe for the matcha version with us on our Shipton Mill blog, to show us what they’ve been making with our flour and so we can learn how to try and recreate their beautiful cakes at home. If you’d like to pay them a visit or find out more, you can find the Mille Patisserie website here, and their social media here. There is also a summary demo video of making one of their delicious cakes, to help illustrate the below process. They are based at 8a Spring St, Paddington, London W2 3RA. All photography courtesy of Mille Patisserie. With thanks to Mille for sharing their recipe with us! Whisk the cream, sugar and matcha powder together until the mixture becomes thick and stiff. 1. Whisk the eggs with the sugar together for 30 seconds. 2. Pour the milk into the eggs and sugar, then whisk until the mixture combines together. 3. Add in the sifted flour plus the matcha powder and mix this in until the batter is smooth. 4. Add in the melted butter gradually. 5. Sieve the batter into a large bowl to avoid any lumps. 6. Chill for at least 1 hour in the fridge. 7. Heat your crêpe pan over a medium heat for 1 minute. To test whether the pan is ready to use, put a little bit of batter on the pan for 10 seconds. If the batter stays the same then the pan this ready to use, if the batter burns this means the pan is too hot and if so, put your pan on a cold wet tea towel to cool it down. 8. Use a ladle to pour your batter onto the pan enough so it fits the pan spreads evenly and very thinly. Make sure to divide it up to be able to make 25-30 crêpes. 9. After the crêpe’s colour turns a little brown, peel the crêpe off the pan. 10. Repeat the process, to make 25- 30 crêpes (depending on how much batter you have left). 11. Use an eight inch cake ring to cut the crêpes into the same size. 1. Place your crêpe on your turn table, and put one scoop of matcha cream on your crêpe. 2. Spread the cream evenly over the crêpe with your pallet knife. 3. Repeat around 25 times, until you have used up all your crêpes. 4. Melt 20g of white chocolate in a bain marie over a low heat, and then add 3g matcha powder in white chocolate. Stir to combine. 5. Pipe the chocolate thinly over the top of your cake. 6. 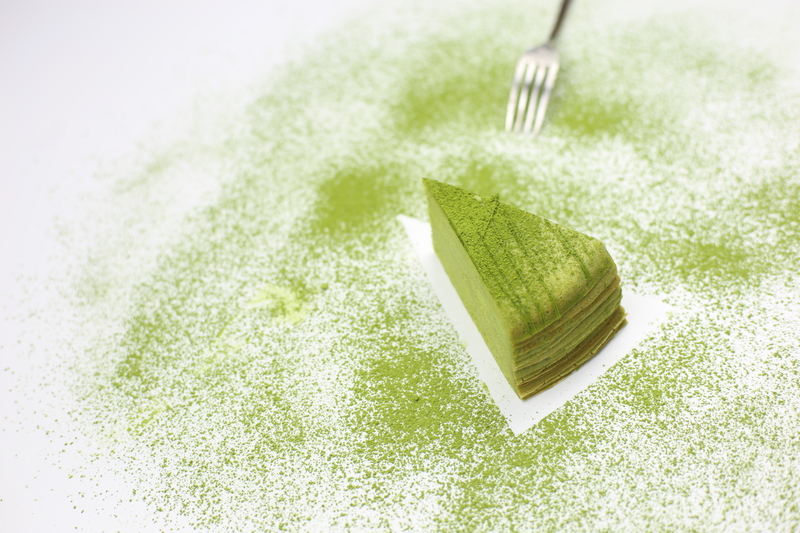 Dust with matcha powder. Store in the fridge, and eat within a day of making.